The Federal Home Finance Agency (FHFA) made a recent HARP update. As of late last year, the new start date for HARP-eligible loans must be on, or before, May 31, 2009 where “start date” is defined as the date on the mortgage. Previously, HARP was only available to homeowners whose mortgages were sold and securitized on, or before, May 31, 2009. It’s a small change, but one that puts the “Obama Refi” within reach of additional U.S. households. HARP : Saving Homeowners $21 Billion Annually? The Home Affordable Refinance Program is nearly 5 years old. It was first introduced in March 2009 as part of that year’s economic stimulus, and is available through the program’s December 31, 2015. HARP is touted as the “underwater mortgage”. It makes today’s low mortgage rates available to homeowners whose homes have lost value since purchase. When it first launched, HARP was timely. Home values were sinking as fast and mortgage rates were, too. Homeowners with Fannie Mae- and Freddie Mac-backed mortgages, however, were unable to refinance. They lacked sufficient home equity to qualify for a loan. HARP mortgage guidelines instructed lenders to overlook a homeowner’s loan-to-value (LTV) and to refinance their home loan anyway. Interestingly, HARP was not billed as a housing market stimulus but, rather, an economic one. The government’s goal with HARP was to boost consumer spending. By giving U.S. homeowners access to lower mortgage rates and payments, the government posited that households would have more available money to spend on goods and services. How much more? Roughly $21 billion, based on two government claims about HARP. First, that the program would save the typical U.S. household $3,000 annually; and, second, that HARP would reach 7 million households nationwide. After two years, however, HARP was falling short of its household target. Fewer than one million transactions had closed. So, to put the Home Affordable Refinance Program in the hands of more homeowners, in late-2011, Fannie Mae and Freddie Mac began to lift program restrictions. First, gone was the requirement that HARP loans cap at 125% LTV. Second, gone was the requirement to use your same mortgage servicer. And, third, gone was the verification of income, assets and credit. Via “HARP 2.0”, homeowners could refinance at any LTV with any mortgage lender with fewer hurdles. The program suddenly resembled the Federal Housing Administration’s FHA Streamline Refinance and the Department of Veterans Affairs’ VA Streamline Refinance. HARP became the “streamlined” conventional refinance program and, since HARP 2 launched, closings have tripled to 3 million loans nationwide. Now, though, again, Fannie Mae and Freddie Mac have tinkered with HARP. The first change was to extend the program deadline by two years to December 31, 2015. The next was to update the program’s eligibility requirements. It’s another small step toward the release of HARP 3. Mortgage rates today are lower than the government ever expected. As a result, today’s HARP-refinancing homeowners are saving more money than projections predicted they would. At today’s low rates, for example, to meet “$3,000 in annual savings” via HARP, your mortgage loan size would have to have been $163,000 when it started. Many U.S. homeowners borrow more than that, though, so if your loan size exceeds $163,000, you’re expected to save more than $3,000 annually. For example, a homeowner whose original loan size was $250,000 could use HARP to save $4,800 per year. A homeowner whose original loan size was $400,000 could save $8,000 annually. Despite the big savings, HARP refinance volume is slowing. In October, the number of HARP mortgages fell to its lowest point since the launch of HARP 2.0 and interest in the program appears to waning. This is likely an awareness issue because millions of U.S. households remain HARP-eligible and most are saving more than 27% annually. Beyond that, HARP guidelines are similar to other streamlined refinance loans — documentation requirements are fewer, appraisals can be skipped, and underwriting turn times tend to be faster. But with volume slowing, there’s a chance that HARP 2.0 gets revamped like its predecessor. HARP 3 could feature a host of changes including opening the program to non-Fannie Mae and non-Freddie Mac homeowners; extending the program’s start date from May 2009 into 2011; and, allowing the “Re-HARP” of an existing HARP home loan. A HARP 3.0 bill is currently in committee in Congress. Fannie Mae and Freddie Mac could wait for its passage, or may release additional HARP updates on their own, independent of Congress. 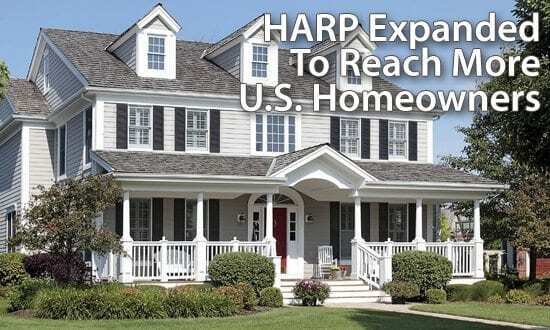 The HARP program is expanded and available to a wider group of U.S. homeowners than ever before. Plus, with mortgage rates at a 4-month lpw, the opportunity for savings remains huge. Take a look at today’s live mortgage rates and see how the government’s HARP refinance can help you save money. Rates are available online for free, with no cost or obligation. Click here for today's live HARP mortgage rates (Apr 21st, 2019).